Single Correct Answer Multiple choice questions with a single answer award 100% points for a correct answer and 0 points for an incorrect answer. Multiple choice questions with more than 1 answer will award 100% points if all correct answers are chosen and no incorrect ones. In multiple choice questions with multiple correct answers, AT&S deducts points for incorrect answers down to zero, but it will not go negative. The software divides the total number of points for the question BY the total number of correct choices, and that’s the penalty students will get for each incorrect choice checked. Suppose you have a M/C question that is worth five points. 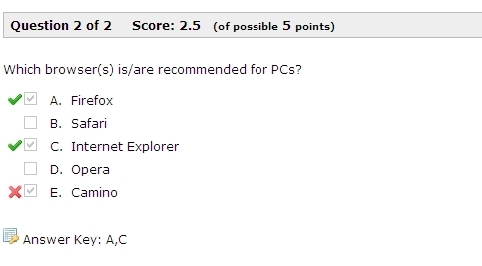 It has five choices, one of which is correct. The correct answer is, therefore, worth the full five points. Each incorrect answer will result in the deduction of five points, as well. If a student checks the correct choice, but also checks two incorrect choices, she will earn 0 points: Five points for the correct choice, minus five points for each of the incorrect ones (-10). The software does not go negative. She earns zero. Suppose you have a M/C question that is worth five points. 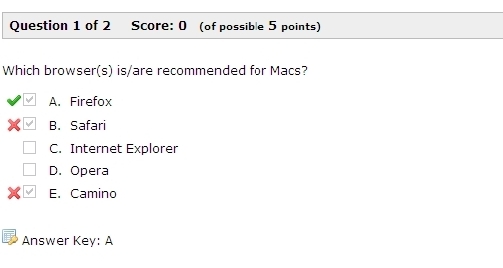 It has five choices, two of which are correct. Each correct answer is worth 2.5 points. Each incorrect answer will also result in the deduction of 2.5 each. If a student checks both of the correct choices but also checks another choice that is not correct, she will earn 2.5 points total. The student will earn 5 points for the correct choices, and will be deducted 2.5 for the incorrect choice. True False Since T/F questions are single-answer by definition. A correct answer is awarded 100% points and an incorrect answer gets 0 points. Single Blank Fill in questions with a single answer give 100% points for a correct answer and 0 points for an incorrect answer. Fill-in questions with more than one blank will give 100% points if all answers are filled in correctly. If there are multiple blanks, each blank is worth an equal proportion of the total number of points of the question. The total points received will be the number of answers filled in correctly times that proportion. There is no penalty for incorrect. For example, if there is a fill-in question worth 5 points with three blanks, each blank is worth 1/3 of 5, or 1.67 points. If a student answers two blanks correctly but not the third, the student gets (1.67 X 2 ) or 3.33 points for that question. Inline drop-down single choice with only one drop-down give 100% points for a correct answer and 0 points for an incorrect answer. Inline drop-down single choice with more than one drop-down will give 100% points if all answers selected are correct. If there are multiple drop-downs, each drop-down choice is worth an equal proportion of the total number of points of the question. The total points received will be the number of answers answers correctly times that proportion. There is no penalty for incorrect. For example, if an inline drop-down question worth 5 points with three drop-downs, each is worth 1/3 of 5, or 1.67 points. If a student answers two drop-downs correctly but not the third, the student gets (1.67 X 2 ) or 3.33 points for that question. In ordering questions, each item is worth an equal proportion of the total number of points for the question. Each item that is placed in the right order gets that proportion. There is no penalty for incorrectly ordered items. Students don’t earn points for them. Matching questions have multiple answers (pairs). Each correct pair matched is worth an equal proportion of the total number of points for the question. For each correct pair, the student gets that proportion. There is no penalty for incorrect pairs. For example, if there is a 5-point matching question that has 6 matches, each answer is worth 0.83 points. So if the student answers 4 out of the 6 matches correctly, he’ll get (4 x 0.83), or 3.33 points for that question. Note: It is a good idea to place matching questions into its own pool worth more points than, let’s say, True/False. That way the question will carry more weight. Essay or task questions are graded manually. The instructor decides on the point total and assigns accordingly. If your assessments have essay questions that you have not graded yet and your assessments are set to “automatic release,” then, students will be able to see how many points they earned in Review (if enabled). However, if you haven’t graded the essay questions yet, the total score that students will see in review is “partial” – and thus, the designation. The score will be listed as ‘partial’ until you grade the essay / task questions and release the submissions to students. If you don’t want students to see a (partial) score until after you have graded the essay questions, then choose “manual” grading in the settings of the test instead of “automatic.” This way, you can choose when you want to release grades to students (the whole class or individually), as you grade each submission or all at once when you are done.